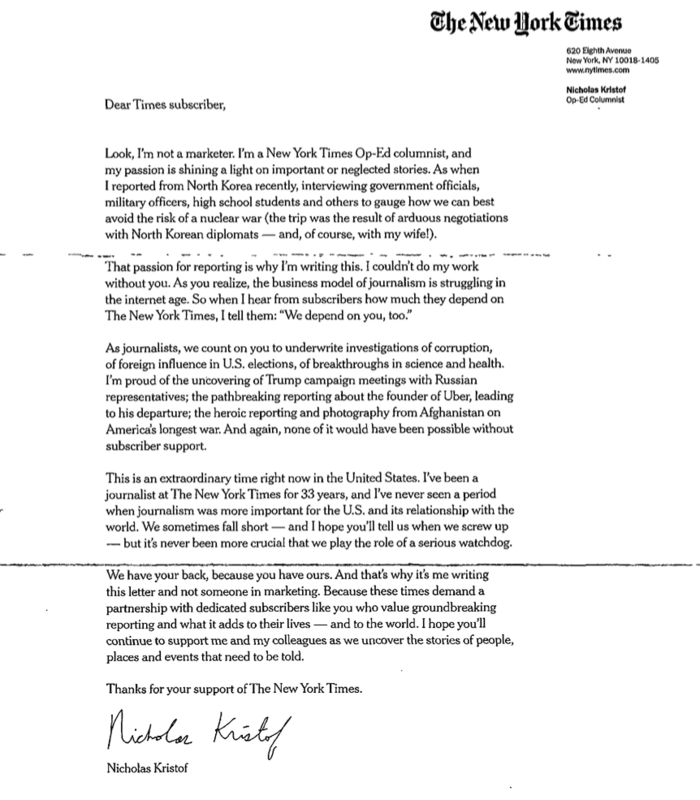 As the hardworking staff has previously noted, the New York Times routinely deploys its journalists to accompany (and schmooze with) civilians on Times Journeys to the four corners of the earth – an enterprise that is rife with potential conflicts of interest, as the Washington Post’s Paul Farhi pointed out recently. Now the Grey Lady is asking its newsroom staffers to sing for their supper in a series of sycophantic salutes to the paper’s subscribers. There was this letter sent to subscribers last month. Politico’s senior media writer Jack Shafer promptly blowtorched the Times in a piece headlined “New York Times Journalists Are Groveling to Their Readers. That’s Pathetic.” Subhed: I don’t want my favorite hacks turned into marketers. Two things bugged me about the letter. First was Kristof’s presumption that I might be a willing vessel for his gratitude. My relationship with him is more like my relationship to the station manager of the subway—he’s just another interchangeable employee producing a service that I use. I need or want a letter of thanks from Kristof as much as I do one from the station manager for riding the train. 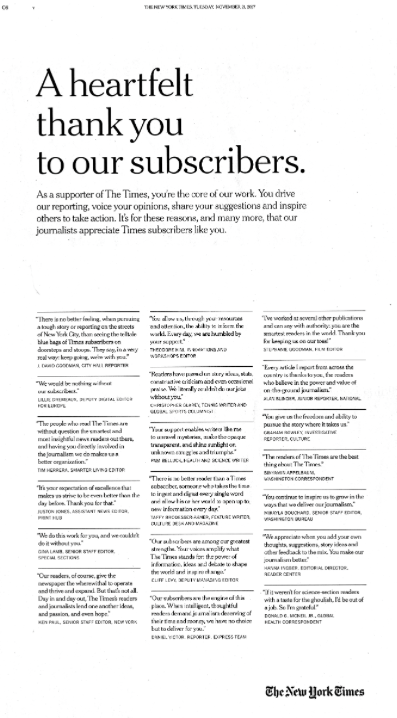 The truth of the matter is that I don’t subscribe to the Times so that he can, in his words, shine “a light on important or neglected stories.” I tolerate his heavy moral preening and self-indulgence so that I can read the rest of the Times package. His gratitude is the last thing I want from the paper. Shafer was equally unhappy with this “cringeworthy” full-page ad that ran the day after he’d gotten the letter. Ugh. Whatever happened to the separation of church and fourth estate? Yesterday’s Times featured this half-page version of the big wet kiss-up. 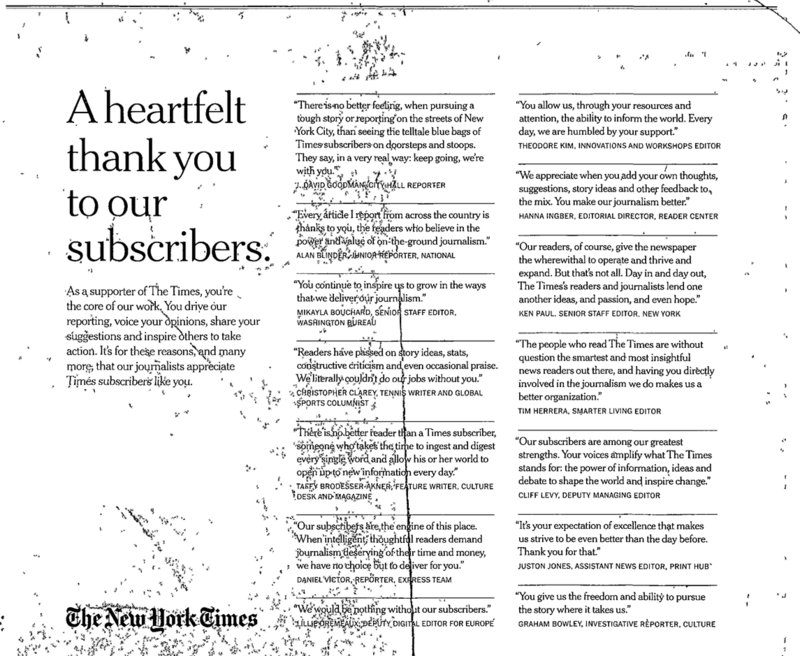 The quality of that screenshot is so poor because the Times’s Replica Edition has been unavailable for the past few months, so we were left to our own devices for the image. 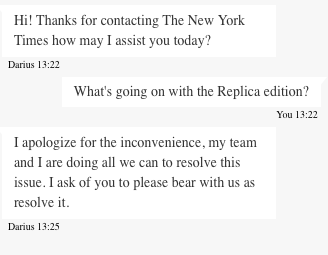 Earlier today the hardtsking staff had this exchange with a Customer Care representative. That’s the same thing we were told six weeks ago when we inquired about the Replica Edition. Maybe they should stick that in their next ad. This entry was posted in Uncategorized and tagged Binyamin Appelbaum, Jack Shafer, Nicholas Kristof, Paul Far, Politico, separation of church and fourth estate, Times Journeys, Times Replica Edition, Washington Post. Bookmark the permalink. Maybe they should start wearing red lipstick and stilettos to set the mood. Absolutely would not surprise me.